Are you aware of the critical importance of integrating phonological and phonemic awareness activities into your first grade classroom, but don’t have a resource readily available to you? This phonological & phonemic awareness resource is highly engaging, is geared to the various levels of learners in your classroom, and, best of all, it’s easy to use. Are you aware of the critical importance of integrating phonological and phonemic awareness activities into your kindergarten and first grade classrooms but don’t have a resource readily available to you? 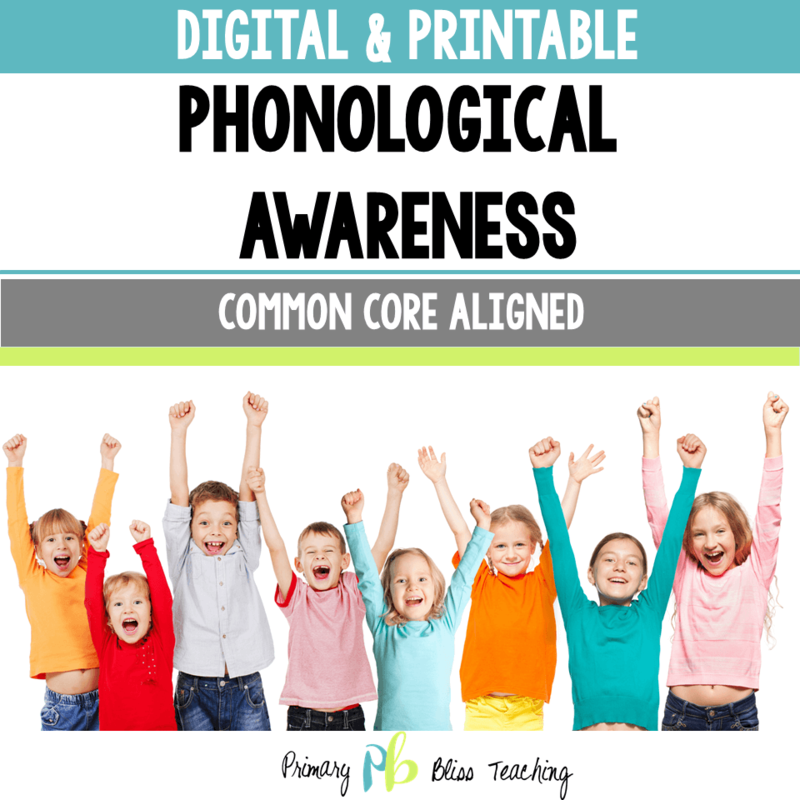 This phonological awareness resource is highly engaging, is geared to the various levels of learners in your classroom, and, best of all, it’s easy to use. 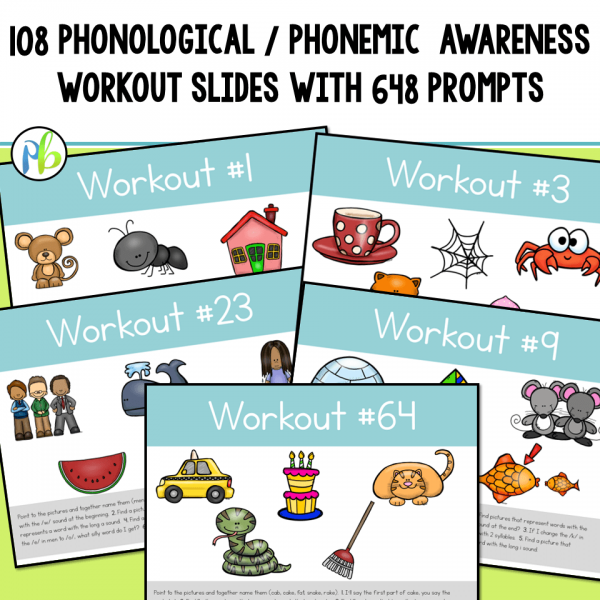 This resource contains 108 phonological awareness workout slides. 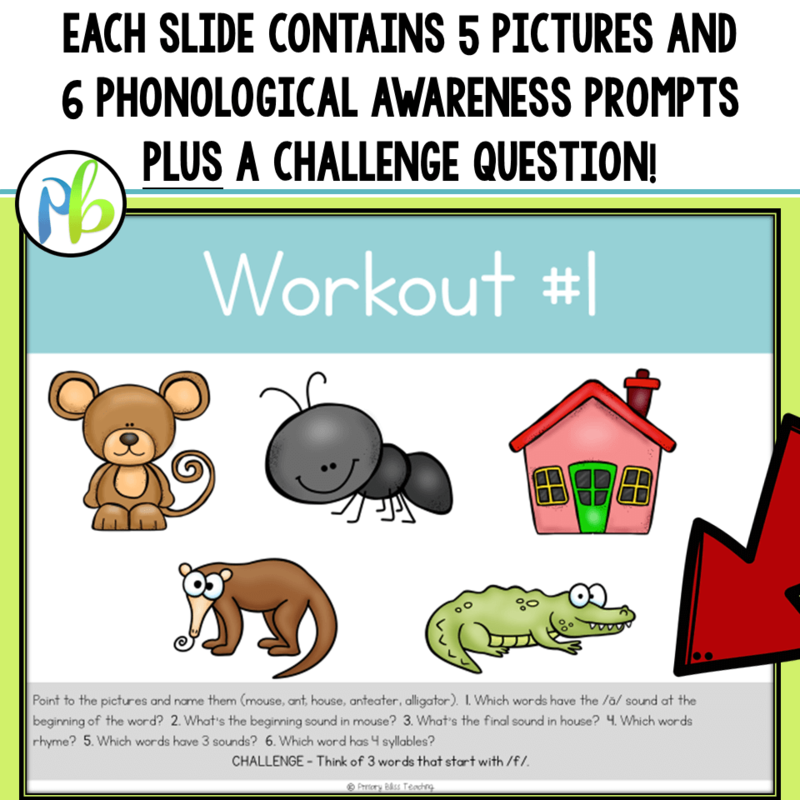 Each slide contains 5 colorful pictures and six phonological awareness prompts linked to the pictures that address kindergarten and first grade standards. There are 648 prompts in all, more than enough to get you through the school year. We have included both a digital version of this product as well as a print version. Just display the slide on your interactive whiteboard (or display a printed slide under a document camera), name the pictures on the slide with your students, share the prompts (one at a time) with your students, and let them get to work! Use of this resource is easy for the teacher to implement, which means it is more likely to be used on a daily basis. And it’s highly engaging for the students, which ultimately translates to students who become better readers. Additionally, the prompts are differentiated, which benefits learners of all levels. We are currently first grade teachers. 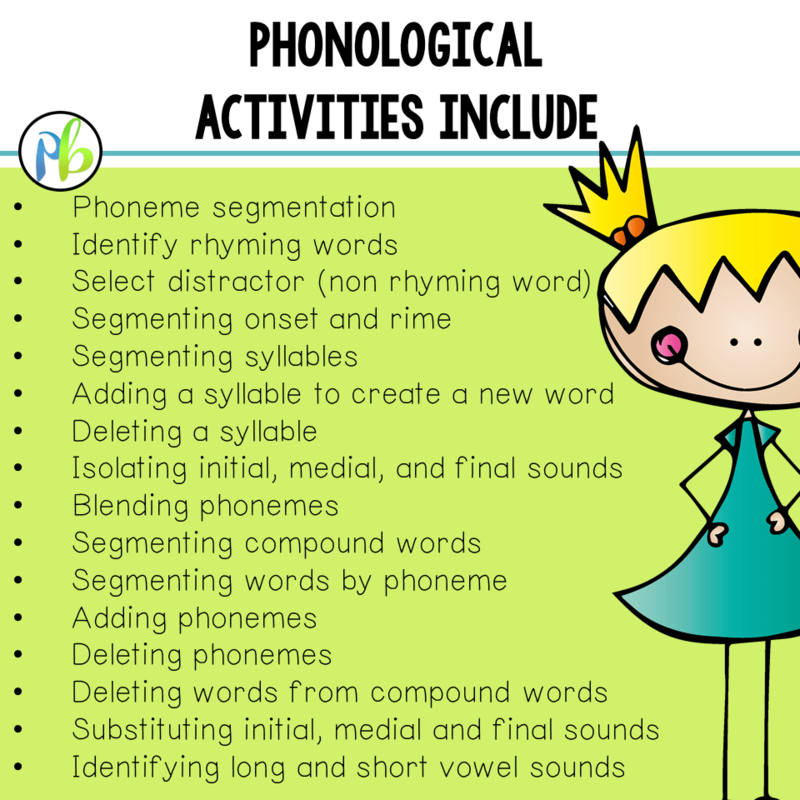 While we are aware that phonological and phonemic awareness activities are critical to students learning to read (students who lack this type of awareness severely struggle with reading), these activities are virtually non existent in our district adopted curriculum. We created this resource in order to meet our students’ needs. We decided to use colorful pictures to increase students’ interest and create PowerPoint slides with prompts directly on the slides to make our teacher life easier.